Normally, Pokémon have five regular status ailments. However, there is a sixth, unique affliction that can happen out of the blue. If you suddenly come across a Pokémon with a fuschia-colored status that refuses to go away no matter what you use in hopes of curing it, then you've stumbled upon the fascinating Pokérus virus. Your Pokémon may be infected with Pokérus. Little is known about the Pokérus except that they are microscopic life forms that attach to Pokémon. 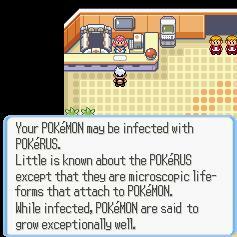 While infected, Pokémon are said to grow exceptionally well. Pokérus will cause the infected Pokémon to gain double the Effort Values (EV) it gets from beating other Pokémon. In other words, if you won against a Gyarados, you would normally recieve 2 Effort Value points that will help increase the Attack stat of the victorious Pokémon when it levels up. However, Pokérus causes it to receive 4 Effort Value points, meaning the Attack stat would rise much faster than usual. Therefore, Pokérus can manipulated across all six Pokémon stats to balance out their weak points, such as heightening a poor Defense. Though it is very rare to discover a Pokémon with Pokérus, a single infection is highly contagious. When placed in your party and allowed to remain with you for several Pokémon battles, it spreads the infection to the two neighboring Pokémon in your party that come before and after it in party order, which will then infect the others that are in close proximity. Pokérus is cured after 24 hours on the party from the time of infection. After the virus wears off, a dot takes its place, meaning that Pokémon is now immune to the virus and can't catch it again. The accelerated stat growth remains, however; the only change is that the Pokémon can no longer spread it. Fortunately, the virus can be incubated for as long as you wish. When an infected Pokémon is put in the PC, the 24 hour countdown that results in the curing of the Pokérus will be frozen. It will not resume until the infected Pokémon is brought back out into your party, but it cannot infect any other Pokémon inside the PC. However, doing this will ensure you always have a Pokemon that can transmit the infection to others at your convenience. Pokémon cannot be cured of Pokérus if left in a PC box or traded to Pokémon Box: Ruby & Sapphire. This means you can deliberately infect one or more Pokémon you don't intend to use and then keep them in one of these two places, so you always have some infected Pokémon in your possession. The more infected Pokémon you store, the more backups you have if you accidentally leave one out long enough to be cured. You can also trade Pokémon infected with Pokérus to copies of Pokémon FireRed and LeafGreen. These games do not have an internal game clock feature to trigger the automatic curing, resulting in permanent infections as long as the Pokémon remain within those respective games. However, because Kanto and Hoenn are so far apart, you will not be able to trade Pokémon from the Hoenn region over to the Kanto region until you complete an in-game sidequest within the Kanto region to make the separate trade networks within transmitting range. This page was last edited on 31 December 2012, at 07:25. This page has been accessed 41,414 times.